With every holiday, whether it is Kwanzaa, St. Patrick's Day, or Christmas, there is a song that comes with it. And, with every holiday song, there is a parody of that song. Talented recording artists have even written original funny holiday songs. 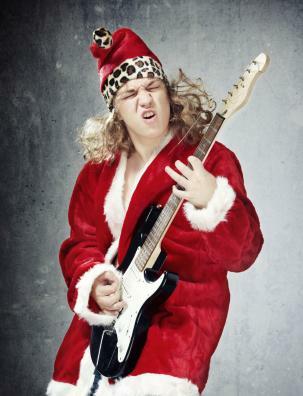 These hilarious musical gems give people yet another reason to rejoice when holidays arrive. While there is no shortage of funny Christmas songs, these are some of the best tunes new and old. Adam Sandler introduced this holiday classic in the '90s during his stint on Saturday Night Live. Sandler takes a comical look at another winter holiday: the Jewish celebration called the Feast of Dedication or Hanukkah, which dates back to ancient Israel. The song became such a hit that even those unfamiliar with Judaism embraced the song's lyrics enthusiastically. Jeff Marx, the creator of the irreverent hit Broadway show Avenue Q, accomplishes two things with this clever song. He pokes fun at the clumsy way that Caucasian people try to show respect for Kwanzaa, and he performs an earnest and warm-hearted musical tribute to African-American culture. This Irish version of Danny Boy performed for St. Patrick's Day by The Muppets might be one of the funniest holiday song performances of all time. Gene Autry, the country singer and songwriter responsible for the legendary holiday song Rudolph the Red-Nosed Reindeer, also penned a cute little Easter song that is charming, amusing, and a fun diversion from the usual holiday fare. Like all good country songs, it also tells an entertaining story that both children and adults can enjoy. Proud patriotic songs are fantastic, but sometimes it helps to lighten the mood. Pavement's No More Kings uses a creative dose of indie rock to tell the story of America's independence while Dr. Chorizo's quirky Happy Fourth of July Song takes a comedic and slightly nostalgic look at the way Americans celebrate their independence each year. Not everyone enjoys holidays when they come around. In fact, some holiday seasons are difficult for people for various reasons. This is what makes funny holiday songs wonderful. They allow a person to lighten up, make fun of themselves and their culture a little, and, the most important thing of all, laugh.